What are Paper Coin Flips? 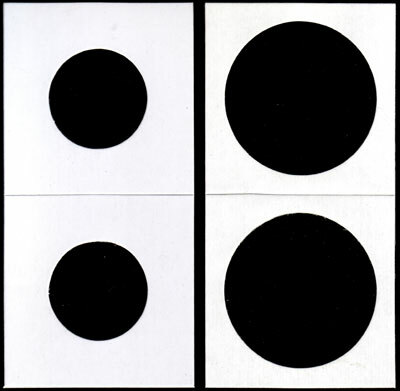 Paper flips (also known as cardboard flips) are flat, rectangular pieces of thin cardboard lined with a clear plastic film on one side. The flip folds in half, forming a square, with the plastic on the inside. Each half of the flip has a hole, or window, in the cardboard (but not in the plastic), and they line up so that when folded in half, you can see all the way through the flip. 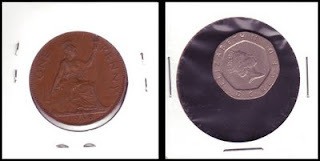 If you put a coin in the folded flip, it can be seen from both sides but will be covered, and protected, by the plastic film. Paper flips are very easy to use, but using them correctly requires a little practice. I'm going to guide you through the process so that you'll be better prepared when you start putting your own coins in flips. Flips are usually available in 3 different sizes - 1.5x1.5, 2x2, or 2.5x2.5. These represent the width and height, in inches, of the flip when it is folded (remember, they start as a rectangle, but you fold them in half to store a coin). A 1.5x1.5 flip will fold into a square that is 1.5 inches wide and 1.5 inches tall. The size of the flip should match how you are going to store your flips once you have put coins in them. If you are going to put them in a binder with pocket pages, then get flips that are the same size as the page pockets (the binder page should say - the pockets will either be 1.5x1.5, 2x2, or 2.5x2.5). A 1.5x1.5 flip will of course fit in a 2x2 page pocket, but it will not be held as securely as a 2x2 flip would be - it is best to get the same size flip as your binder page pockets. In my experience, 2x2 flips and pocket pages are the most common. So if you're not sure what you should get, start with 2x2 flips and pages. On the left, the window is too small for the coin. On the right, the window is too big. In addition to picking the size of the flip itself, you need to pick the size of the window, or hole, that is in the center of each half of the flip. You want the window to be slightly bigger (1/8 to 1/4 inch) than the coin you want to store. 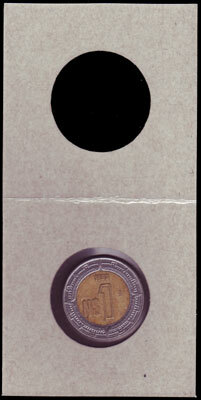 If the window is too small, then the edge of the coin will be hidden under the cardboard. If the window is too big, then the coin will move around once the flip has been sealed. In the US, flips are usually sold according to the size of US coin that the window can correctly hold. From smallest to biggest, these are: dime, penny, nickel, quarter, small dollar (Presidential and Native American dollars), half-dollar, and large dollar (old "silver" dollars). World coins come in a lot of different sizes, so you should have flips with a couple of different window sizes on hand to pick from when you're putting new coins in your collection. That way you can pick the flip that has the appropriate size window for each coin. But you don't have to have every size of flip listed above (for example, any coin that would fit in a dime-sized flip would fit just as well in a penny-sized flip). I find that most of the world coins I collect will fit correctly in either a quarter-sized flip or a half-dollar-sized flip. The rest are either very small and should use a penny-sized flip, or are larger and need a large dollar-sized flip. 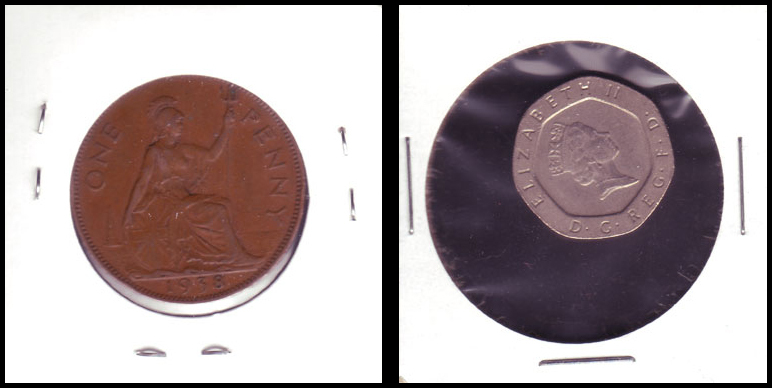 For very thick coins (such as the pound from Great Britain), the window should be a bit bigger than you'd normally pick. This is because the thickness of the coin could cause the plastic to stretch and break if you choose a window size that is just big enough for the coin. Once you've picked a flip with the correct window size, you're ready to seal a coin inside it. 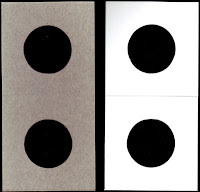 Flips have 2 sides - the outside is usually white, and the inside is usually brown/grey (the color of cardboard) and has the plastic film on it. 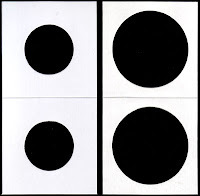 Place the "outside" face down on a flat surface, so that one hole is above the other (not to its side). Pick which side of the coin you want to be on the "front" of the flip. The "front" is the side of the flip you are going to label, so it will be the side that is seen more often (you'll still be able to see both sides). You may want to pick the "heads" side of the coin, or the side with the most interesting picture. Place the coin in the center of the bottom window of the flip so that the side you've picked to be in the front is facing you and is right-side up. Fold the top half of the flip down so that it covers the coin. 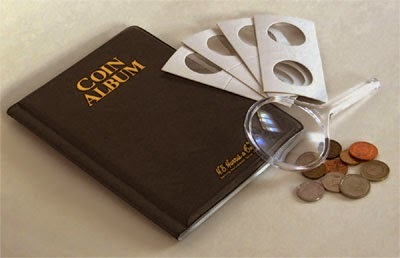 The 2 window holes should line up exactly, and the coin should now be covered both front and back by the thin plastic. Pick the flip up while holding it closed, and place your fingers on the window so that the coin can't move. The coin is protected by the plastic, so your finger oil is not touching the coin. Use tape or a stapler to close the bottom, left, and right sides of the flip. The 4th side (the top) is already sealed because that is where the flip folded in half. If you're using staples, staple with the "front" side of the coin facing up, so that the main bar of the staple will be visible on the side of the coin you prefer. The coin is now sealed and protected inside its flip. Should you seal your flips with tape or with staples? I prefer staples because they allow the flip to be sealed closer to the coin. If you use tape, the crimped point of the flip - the spot where the flip is being held together - is way out at the edge of the flip. That means that the flip is not as tight on the coin as it would be if you used properly-placed staples (discussed below), and so a coin in a properly-sized flip could still move around. Tape does have one advantage over staples - if you need to open a flip, you can cut the tape and then seal it shut again with a new piece. When you fold a flip in half, it is unsecured on 3 sides - the fourth side has the fold, and is already sealed shut. You need to staple, at a minimum, the three unsecured sides so that they won't come open and will better seal out air, dust, and even moisture. The fourth side, with the fold, doesn't require a staple to stay closed, but without one that fourth side will be less tight than the other three and your coin may tend to slide toward that side. Even so, I prefer to use 3 staples so that the folded edge has maximum room to write. Don't staple too near the edge of the flip - it won't hold the coin as tightly, and if you get too close to the edge the staple might come loose. Also, don't staple too near the window - it could grip the coin too tightly and tear the protective plastic, or you might put a hole in the window plastic and allow air and dust to get inside. Usually you can aim for halfway between the flip's edge and the window. If the coin is thick, or just barely fits in the window, staple closer to the edge. If the coin is significantly smaller than the window, staple closer to the window so that the plastic is tighter against the coin. Once your coin is sealed, it's time to label it. Putting what you know about the coin on the flip saves you from needing to look it up again later, and paper flips are great for writing on. You may not know all of this right now about the coin, and that's fine - write down what you know and leave room to fill in the other information later. Using a pen or pencil (pen will last longer and fade less), write the coin's information on the "front" side (the side of the coin that you decided was the best looking) of the flip. If you've used 3 staples instead of 4, the unstapled side should have ample room for keeping track of your most important information (country, year, denomination, and amount). If the coin has a mint mark, include that with the year, like "1995 B". Information like the grade, composition, and KM number can be at the bottom or on the back of the flip - this is information that you'll probably use less often, so it is OK if it is not prominently displayed. When you label your flips, be consistent - always write everything in the same place on each flip. This will make it easier to look through your coins later. Now your flip is ready to be stored in either a binder page or a coin storage box. Once your coins are secured into flips and labeled, you'll find your collection is much easier to organize, and you won't have to worry as much about further damaging your coins.